Large open evergreen shrub or small tree. Large deep green leaves. 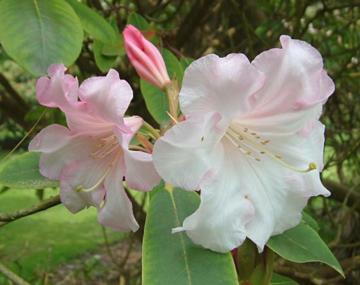 Loose trusses of large, scented, lily-like, pale shell pink flowers with darker veining, in mid and late spring. They tend to fade to near white as they age. Moist, well drained humus rich acid soil. Needs a reasonably sunny but sheltered location with protection from cold winds, open woodland is ideal. Loderi Group hybrid of Rh. fortunei x Rh. griffithianum, raised at Leonardslee Gardens.